Suharto suffered multi-organ failure and was placed on a ventilator Friday, doctors said, as family members rushed to the former Indonesian dictator's bedside. Physicians called his deteriorating health "alarming." The 86-year-old was hospitalized in critical condition one week ago with anemia and a low heart rate. He initially responded well to a blood transfusion and kidney dialysis. His condition has fluctuated almost daily, but Friday's drop was the most dramatic. Marjo Subiandono, the chief presidential doctor, said Suharto suffered multi-organ failure and was placed him on a ventilator after his breathing became fast and shallow. Earlier, doctors said there were signs of infection in his lungs and that he was losing consciousness. The former strongman was given a tranquilizer to help him sleep, the doctor said. "His condition is deteriorating," said Ismoyo, a cardiologist, who was among those describing Suharto's state Friday as "alarming." "It's worse than it was this morning." Relatives gathered by Suharto's bedside to pray and recite verses from the Quran, a close aide to the family told The Associated Press. He asked not to be named because he was not authorized to speak to the media. Suharto was ousted in 1998 amid massive student protests and nationwide riots, opening the way for democracy in this predominantly Muslim nation of 235 million people. The retired five-star general withdrew from public life, venturing from his comfortable villa on a leafy lane in the capital only to attend family functions or for medical emergencies. A series of strokes in recent years have left Suharto with permanent brain damage and impaired speech - keeping him from facing trial. He has been accused of overseeing a purge of more than a half-million, left-wing opponents soon after seizing power in a 1965 coup. Hundreds of thousands more were killed or imprisoned in the decades that followed - crimes for which no one has ever been punished. Transparency International says Suharto and his family also amassed billions of dollars in state funds - an allegation he has denied. Victims and relatives of those who died gathered outside the hospital Friday, some carrying banners that said "Bring Suharto to Justice!" "His illness should give momentum to the human rights commission, legislators, the president and the attorney general to investigate all the abuses for which he was responsible," said Sumarsih, whose daughter Wawan, was killed by troops during a 1998 anti-Suharto protest. Like many Indonesians, she has only one name. "He is sick, and people can forgive him for humanitarian reasons if they want to, but they should not forget our grief." He said he was imprisoned without trial from 1969 until 1979 after being accused of having ties to the Communist party, a charge he denied. He was employed by Unilever Indonesia at the time, and acknowledged only that he had been a labor activist. "I'm sorry (Suharto) is sick, but I can't forgive him," said Saleh. "I suffered for many, many years. Someone has to be held accountable." Suharto has received a steady stream of visits by high-profile officials in the last week, including President Susilo Bambang Yudhoyono - now in Malaysia - Cabinet ministers and Muslim clerics, a sign of his continuing influence over the ruling elite. Vice President Jusuf Kalla showed up at the hospital late Friday after receiving word about Suharto's deteriorating health. 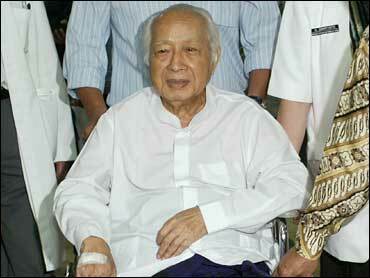 Try Sutrisno, who served as vice president under Suharto, also came. Doctors said earlier Suharto would need a second pacemaker - he suffered low-level cardiac failure after muscles in one section of his heart stopped working - but repeated Friday that the procedure could not be performed until his condition stabilized. He remained hooked to a kidney dialysis machine.